One of the enjoyments of performing restorations on early surveying instruments is when the owner has no idea that he is in possession of an extremely rare and/or important historical compass and you have the opportunity to contact them with a pleasant surprise regarding their instrument. One such instrument was uncovered recently after Colonial Instruments was approached by Martin Donnelly regarding restoration of a Rittenhouse & Evans compass prior to an upcoming auction. The compass had been hand-buffed early on, the silvered face needed some attention, and the gear-driven vernier mechanism was locked-up. Martin sent the compass for restoration and, upon its arrival, I realized I was working on an historically important compass, the earliest recorded four-vane compass. 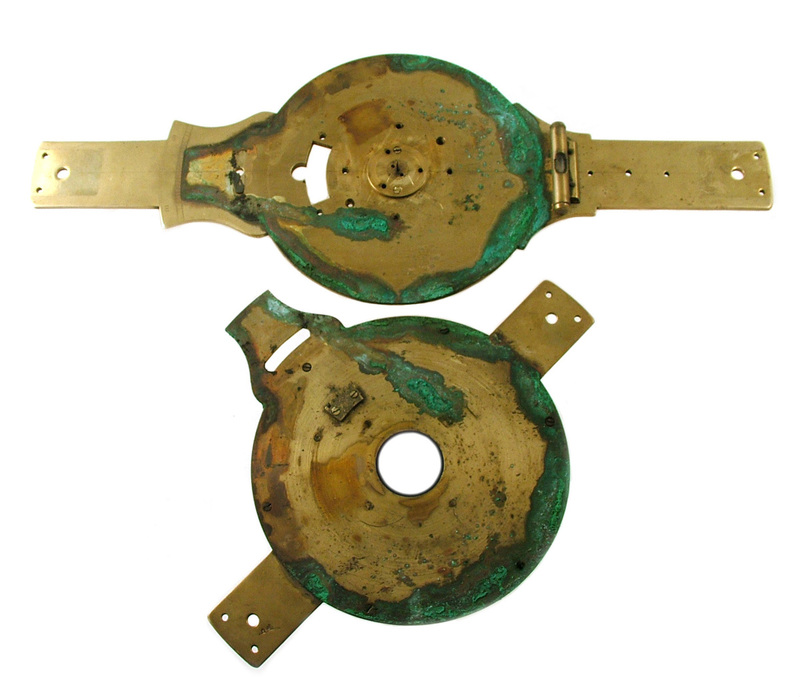 This instrument, however, was also the poster child for one reason “why not to polish.” Upon disassembly for restoration, I found that an excessive amount of polishing compound had wicked under the moveable vernier plate and, over time, had chemically reacted with the brass to form a heavy, crusted residue. This residue had locked-up the vernier plate to the main plate. It took many hours of controlled cleaning to remove the damaging corrosive residue. Fortunately, the corrosive material was carefully removed from the instrument before any serious pitting of the metal had taken place. After the cleaning was completed, the vernier mechanism was returned to its normal, smooth operation. I continue to stress to new collectors: Never polish your instrument; it removes historical data and, in an untreated scenario such as this, the corrosion can erode some of the original brass surface. Another few years and some serious damage would have occurred to this instrument. Keep in mind that all Rittenhouse compasses are very desirable. There are only seven Rittenhouse & Evans recorded to date, which makes them obviously difficult to acquire. This instrument’s claim to fame is the fact that, according to my records, this is the only four-vane compass from the Rittenhouse lineage and pre-dates all other, documented four-vane compasses by quite a few decades. 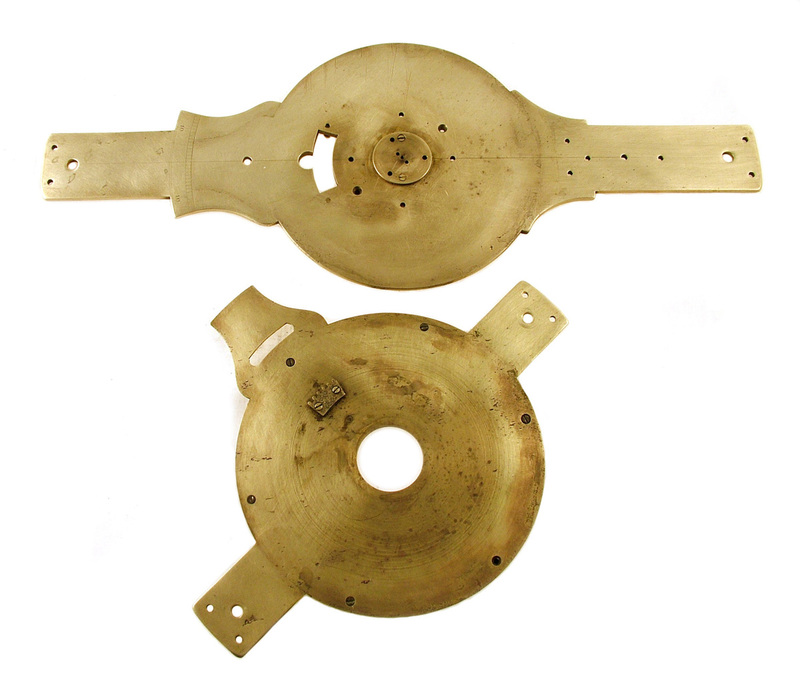 I have seen and worked on other four-vane compasses, all constructed circa 1850 or later. This instrument dates from approximately 1798 when Evans apprenticed with Benjamin Rittenhouse. 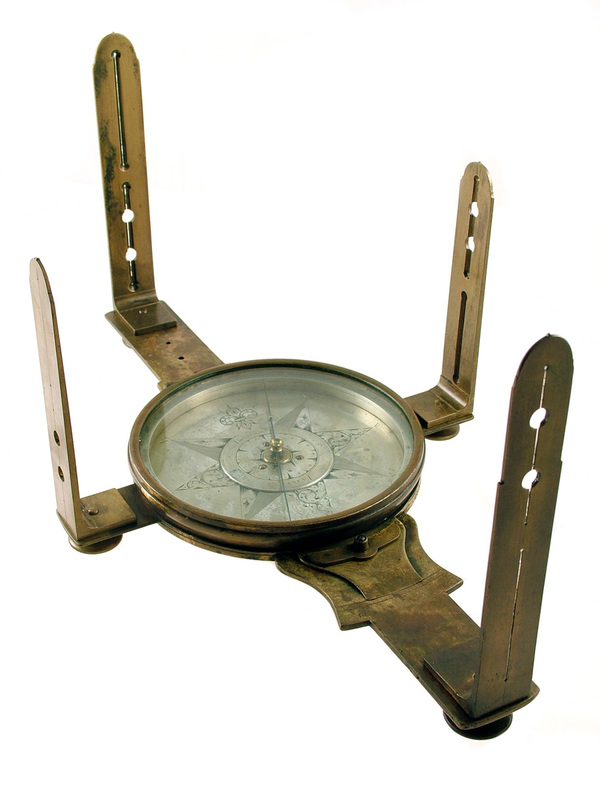 The interesting feature is the fact that this instrument was not a normal vernier compass with two additional vanes added to the compass plate, it was designed longer and with taller sight vanes. The normal length for a standard Rittenhouse & Evans two-vane compass averages 14 1/2” long with approximately 6” vanes. This instrument is 15 3/4” long with 7” sight vanes, demonstrating the fact that it was built larger to accommodate the four-vane configuration. These dimensions, as well as the original footprint, were needed to properly proportion the fabrication for the replacement of the missing secondary vanes. 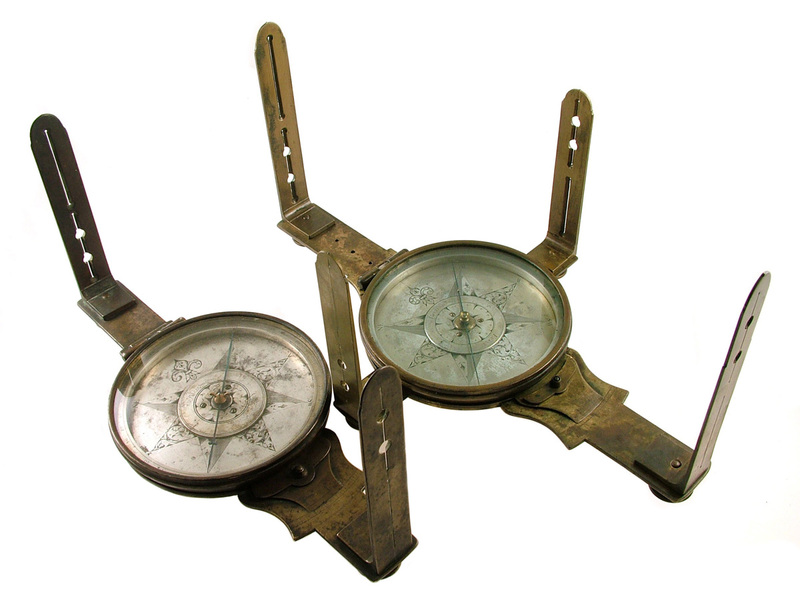 This size difference can be seen in Photo 4 with the four vane compass on the right and the standard Rittenhouse & Evans vernier compass on the left.